India Travel, Tours and Tourism. Best places to be! Best places to stay! 14th Nov 2012 Here is the list of top 75 best value for 2012 - voted by guests who have stayed at these hotels and recommend it to others. These are top rated hotels in Goa, Puri, Ooty, and 20 other cities in India. 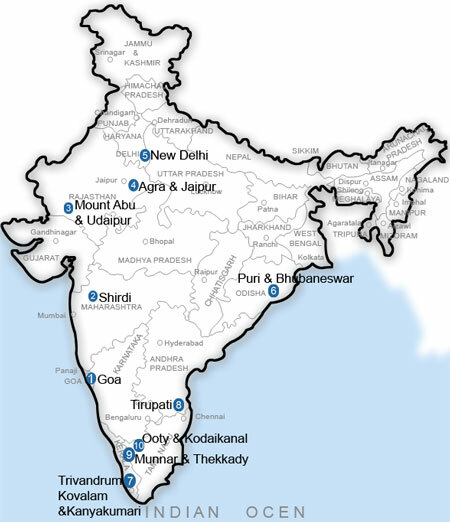 Best Hotels in India- 2012. 1st Nov 2012 Wondering what are the best places to visit in December in India? Goa certainly is one of the favourites for this time of the year. Find out which other cities make it to the Top 10 list specifically for December and also read why they are popular. Top 10 Destinations for December visit. 23rd Feb 2012 April along with May are peak travel time for most Indians primarily because of school holidays. Summer months could be extremely hot in most of the big cities throughout the country. However, there are plently of places to visit between April and June to cool off from the scorching heat and enjoy a relaxing time with your family. Read more about popular destinations for summer vacation (april-jun). 5th October 2011 Have you ever thought of visiting Tirupati? One of the most ancient and spectacular places of pilgrimage, Tirupati owes its existence to the sacred temple of Lord Sri Venkateswara situated on the Tirumala Hill lying adjacent to it. Read about the temples of Tirupati, and several other things to do while in Tirupati. Check out traveler comments and find a good budget or luxury hotel for your stay. Read more. 29th September 2011 Budget hotels make your vacation more affordable. A good budget is crucial for a memorable vacation. Finding a good budget hotel is easy - we have compiled a list of good budget hotels for Top 10 destinations as well as metro cities in India. See the full list of top rated budget hotels in Puri, Goa, Shimla, etc and check out discounted rates on some of these budget hotels. Also find top rated budget hotels in Mumbai and other metro cities. Read more. 9th September 2011 As a traveler, you have questions about your travel destinations. Questions such as how many days to spend at a tourist place, what are the best things to see there, where to dine, and what the best budget and/or luxory hotels near certain places. Find answers to these questions and more at our all new India Travel Forum. 1st September 2011 Announcing our all new India Destinations websites. Find out all you need to know about your favourite cities and tourist destinations - important tourist attractions, places to eat, where to stay and more. Also available are links to useful sites that could help you plan your next trip better. Check out our all new tourist destinations pages. A list of Top 10 destinations in India that are comfortable for short or long stays and are preferred during the summer months. We have compiled a list of tourist destinations that are great getaways during the summer months in India. These Top 10 summer destinations provide relief from the hot summer months that India faces between Mar - June every year. Top 10 Summer Destinations in India. Limited time deals for top value hotels in Mumbai, Kolkata, Chennai, New Delhi, Bangalore, Pune & Hyderabad. Save upto 20% on this metro city hotels. Read about some of the best value hotels in top metro cities across India. We have suggested top 3 budget hotels in Mumbai and hotels in all metro cities. Save upto 20% on these select budget hotels. Read more. Ooty is the queen of all hill stations and is a popular tourist destination. Lots of options are available for hotels in Ooty. A good Ooty hotel will make your vacation more relaxing and enjoyable. Read about top Ooty hotels. Ooty is the queen of all hillstations and is a popular retreat both in the summer and winter months. Tourists from all over the country flock to this beautiful hill station to enjoy the scenary and to have a relaxing vacation with their family and friends. A nice place to stay makes for a more relaxing vacation in Ooty. Good hotels in Ooty are available in plenty and in several budgets. Read more. Calangute has hundreds of hotels & resorts. Wondering where to stay on your next trip to Calangute, Goa? Find hotels other travellers loved during their trip to Goa. Goa can be broadly divided into North and South Goa. Calangute is in North Goa and is just 10 minutes from Panjim, the capital of Goa. Calangute has the best and most famous beaches in Goa.... Two of the highly rated Calangute hotels are Delta Residency and Ticlo Resort. Read more about Calangute Hotels. Everything you want to know about Orissa Tribal Tours. How to book your trip? Group booking options. Explore from 4 to 12 day Tribal Tours options. One of the last remaining truely tribal belt of India, Orissa's remotest regions offer a great opportunity to explore the lifestlye of these tattooed, heavily beaded, nearly naked tribal people, their day to day activity and their extremely primitive way of living. During a typical tribal tour of Orissa, you will get a chance to meet some of these most rural and primitive people, have a glimpse of one of their tribal festivals, attend a weekly tribal market where people from remote villages and mountains meet to exchange food, clothes and other goods. Read more about Orissa Tribal Tours. Read more about Goa beaches and good hotels on Goa beaches.